I really enjoyed both of these novellas. 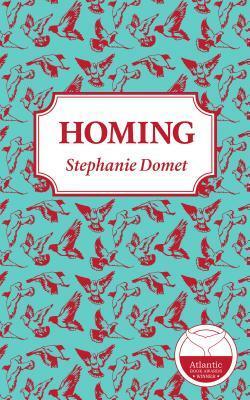 The End of the Alphabet was recommended by Tori at Being Tori in Victoria, and I wanted to read Homing after reading and loving Fallsy Downsies by Stephanie Domet. Both of these are love stories, one at the end of its time, the other at the very beginning. At the age of 50, Ambrose Zephyr is told that he has only a month left to live. He needs to decide how it is he wants to spend the time he has left. He and his wife embark on a whirlwind tour of all the places he wants to visit, from A to Z, but eventually decides that home is where he wants to be. Ambrose is not the only one who has to come to terms with his upcoming death. His wife, Zipper, is trying to figure out what she will do without him. Kitts sat in the eye of her friend’s storm, nodded, shook her head, held tight, wiped Zipper’s dripping face, put the kettle on, wept, buttressed, agreed. Listened. This book sounds depressing, but the story is told with a light touch along with some humour. It is a poetic, touching story about an “everyday life defined by an extraordinary love“. [Ambrose]: When cornered, he claimed to read Joyce, Ford, and Conrad. Rereads of Fleming and Wodehouse were a more accurate library. His opinion of Miss Elizabeth Bennett was not favourable (though he liked Mr. B and held a wary respect for Darcy). Wuthering Heights, according to Ambrose, was the dullest book ever written. [Zipper]: She read everything. Russian epics, French confections, American noir, English tabloids had at one time or another taken their place in a wobbly pile beside the bed. Non-fiction was too much like school, she said. Experimental literature left her cold and annoyed and despairing for the so-called modern craft. She had lost count of how many times she had read Wuthering Heights. Leah is haunted by the ghost of her brother Nathan. Literally. She feels like she will never find peace until she puts things right and helps him find his way. But how to go about doing this? She read in a book from the library that ghosts do not like to be spoken to directly, so got it into her head to use homing pigeons to send him messages. She tapped the pencil’s eraser end against her teeth, tasting a hint of the rubber. It made her think of September, the real new year, the true time of renewal. How she longed for the feeling she got from a fresh package of lined loose-leaf paper. Or the ever-expanding realm of the possible represented by a new box of pencil crayons, their points all uniform and perfect. But what she felt instead was the grubbiness of mid-winter, all brown snow and chapped lips, and scarf that smelled like four months worth of expelled breath trapped forever in synthetic fibres. Nathan hangs out at the Spring Garden Public library, pacing up and down the path next to the Winston Churchill statue, trying to figure out what he’s meant to be doing and where he’s meant to be going. Weirdly, he has made friends with a pigeon who comes to see him everyday, but he’s not sure of the meaning of this. The morning rush of walkers and buses had mostly cleared out, and Nathan emerged from the bushes. He felt prickly, strange, maybe from being so confined all night. He thought he’d take a stroll through the library, get out of the damp for a while… He took the steps carefully, protecting his sore body, and waited till a woman in a puffy ski jacket opened the library door, then scooched in after her. He forgot all about the birds as he wandered the stacks, his long fingers tracing the spines of hardcover books wrapped in clear plastic. He loved the crackly sound they made, the surprise of soft pages, the detritus of other readers. A stray hair, a bit of orange pith, a grease stain from some long-ago eaten snack, pages turned down to mark a place forever. He looked at the titles and the authors’ names as he trailed his finger along each shelf. A person could read a book every day their whole life and still never really make a dent, he thought. Charlotte is concerned about her friend Leah who is seeing ghosts and hasn’t left her house in 2 weeks. She hopes for her sake that this pigeon experiment works out, but can’t imagine how it could. She calls and drops in from time to time, but when she meets a guy who totally sweeps her away, she’s afraid to tell her friend of her good fortune when she’s going through such a hard time. Henry has just gone through a big break-up and is wallowing in self pity in the house of an acquaintance who has gone away on tour. His life is a mess, his career is in a rut, and his dirty laundry is all over the floor. One evening, a pigeon arrives at his house with a note tied to its leg. He takes this as a sign to turn his life around. But where did this pigeon come from? He rummaged trough the pile of clothes on the bathroom floor and wondered when he’d stop living that way. Damp shirts and pants embrace each other; socks and underwear clung to each other in mildewed clumps. It was horrifying, he knew, and it didn’t use to be this way. And even though he knew it would pass… that didn’t make it better right now. It didn’t make him feel any better about sifting through the fetid pile for the least offensive shirt, the darkest pants so they wouldn’t show the dirt, a pair of socks that didn’t make him weep with despair. Johnny Parker has been friends with Henry a long time and is worried about the state of Henry’s life right now. He tries to convince him to come out and meet some girls, but it doesn’t go so well. There’s only so much he can do, really. Johnny doesn’t seem much better off except for his cheerful disposition. Until he meets a girl that he can’t stop thinking about. Too bad Henry couldn’t have the same kind of luck. I love the way the narration skips around from one person to another through the whole book. It kept the story moving along at a quick pace. 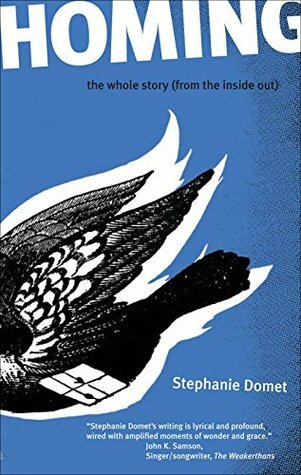 As in Fallsy Downsies, Domet’s writing style is amusing and engaging, and you really end up caring about her characters. Lovely reviews, Naomi. I particularly taken with the Richardson and, to my delight, I find it’s easily obtainable in the UK! I’m happy to hear that you liked Homing. Did you happen to find passages that would work especially well for Project Bookmark? One of my favourite scenes (and I’ve probably mentioned this to you already) is the one on Seymour Street, when Amanda forgets her keys and says, “I’ll just go sleep at my boyfriend’s.” But I can’t quite see an excerpt from that on a plaque, though I often remember it when I walk down that particular street. Probably something set at the old Spring Garden Road Library would work better. I think I wrote down a couple of ideas last summer–I’ll have to check my notes. 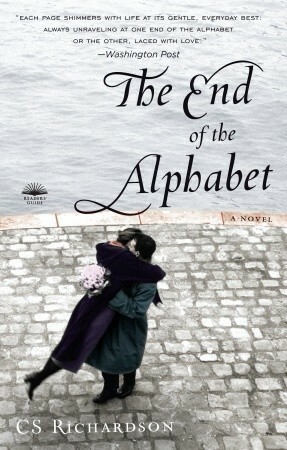 The End of The Alphabet is a lovely title. I haven’t read that one. How can he not like Elizabeth Bennet? Impossible to imagine. I saw the passage in Homing that you mentioned before when Nathan is imitating Winston Churchill’s statue – I thought that was good. I did like the scene on Seymour Street, but I think you’re right, Spring garden Road seems like a better place for a Bookmark. I also really like the description of the snacks being dropped on the ground in front of the library from the people coming from pizza corner. Good to hear, Poppy! I still have 4 more coming from the library that I requested back in October. 🙂 You may already have heard of them all, though, since they are all recommendations from other bloggers. The White Hunger just came in. And, I’m still waiting for The Collapse of Western Civilization and The Lost Daughter. I’m just noticing now that the fourth one is also The Lost Daughter – hmm… strange. I guess we’ll see what comes in! I love ghost stories, but I couldn’t tell how atmospheric this one was from your description. What do you think? It’s definitely not a spooky ghost story – more of an amusing one. Those have their merits, too. I love the sound of the second novella! Sounds like Domet has not disappointed, since you seem to like the novella as much as the book. I loved them both. They’re a nice change from my usual heavier reads. I hope she writes more soon! 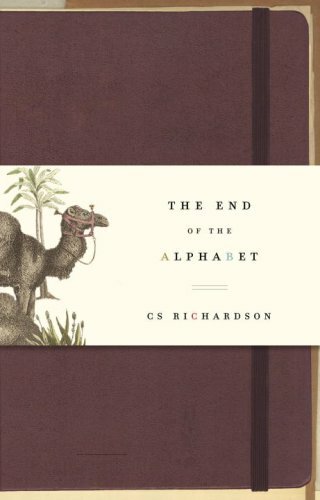 I love the quote you shared from End of the Alphabet…sounds like it was gorgeously written! These both sound beautiful, particularly End of the Alphabet. The End of the Alphabet is more beautiful, Homing more fun. Okay, three more added to my TBR. These two, which both look to be amazing, though very different from each other, and I broke down and marked Fallsy Downsies, too! Sheesh! You’re hard on me, woman! 🙂 Love your quotes! I still can’t figure out why a publisher needs to give a book 27 different covers. It’s like the book is going out to drive test a car and can’t decide which car they want. I don’t really get it, either. But, I have to admit that I do love seeing them all! Wow, 2 1/2 months sounds like a long time, but, hey, at least you were able to get it! Cool! I think I warm more to Zipper than her husband! Together, they made a sweet couple. I think Zipper was more practical than her husband. Hi Naomi, Happy New Year! I’m so glad you liked The End of the Alphabet. And thanks so much for linking to me. I wondered where that spike of viewers came from!